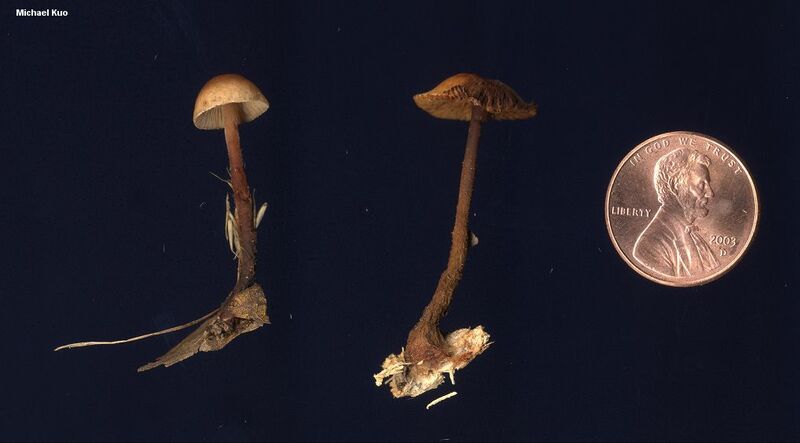 One of several species of Gymnopus that demonstrates a green or olive reaction when a drop of KOH is applied to the cap or stem, Gymnopus spongiosus can be found in late summer and fall in eastern North America (also over winter along the Gulf Coast). The summer/fall appearance helps to separate it from a very close look-alike, Gymnopus semihirtipes, which appears in spring and early summer. 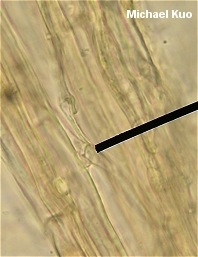 Other crucial identification features for Gymnopus spongiosus include the fact that the hairy tomentum on its stem stretches for the whole length of the stem (rather than merely over the lower portion), the closely spaced gills, and (under the microscope) the absence of dark brown encrustations on the hyphae of the stem. Collybia spongiosa is a synonym. Ecology: Saprobic; growing alone, scattered, gregariously, or in clusters on forest litter under hardwoods (especially oaks) or conifers; summer and fall (or over winter on the Gulf Coast); widely distributed east of the Great Plains. Cap: 1-3.5 cm; convex with a central bump and an incurved margin when young, becoming broadly convex or flat; dry or greasy; bald; sometimes becoming slightly wrinkled with age; reddish brown when young and fresh, quickly fading to pinkish tan or pinkish buff. Gills: Attached to the stem or nearly free from it; close; creamy. 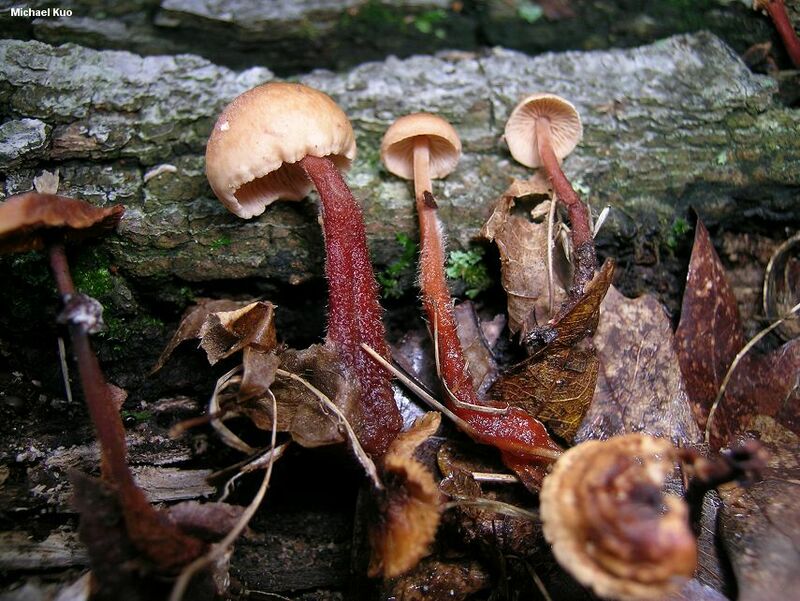 Stem: 2-6 cm long; up to about 4 mm thick at the apex; more or less equal, with an enlarged, spongy bottom portion; dry; densely hairy with reddish brown hairs from the base nearly to the apex; pale above, reddish brown below. Chemical Reactions: Ammonia or KOH promptly olive, green, or black on cap and stem surfaces. 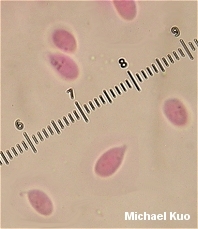 Microscopic Features: Spores: 6-8.5 x 3.5-4 µ; smooth; lacrymoid to elliptical; inamyloid. Pleurocystidia absent. Cheilocystidia often difficult to differentiate, but when present cylindric, subclavate, irregular, lobed or knobbed; up to about 50 µ long. Pileipellis a tangled cutis of cylindric elements 3.5-10 µ wide, not encrusted but with yellowish brown internal pigment in KOH. Hyphae of the stem not encrusted with dark brown material. REFERENCES: (Berkeley & Curtis, 1849) Halling, 1997. (Saccardo, 1887; Kauffman, 1918; Halling, 1981; Halling, 1983; Lincoff, 1992; Halling, 1996; Halling, 1997; Halling, 2004.) Herb. Kuo 09270503.